Austin, Texas — Preservation Texas, Inc. has announced that the Downtown Dallas Historic Preservation Task Force will receive its 2016 Alamo Award on February 18, 2016. The Alamo Award will be presented at a special ceremony at the historic State Theatre on Congress Avenue in Austin as part of the Preservation Texas 2016 Summit. The Alamo Award recognizes that not all preservation battles are successful. The award honors a valiant effort on behalf of historic preservation that did not have positive results, but succeeded in securing a commitment to preservation in the community. 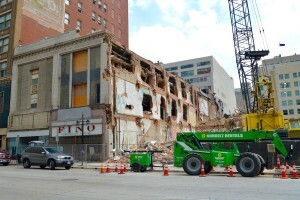 The demolition of several historic downtown Dallas commercial buildings in the fall of 2014 shocked and surprised the preservation community statewide. Preservation Texas responded by including downtown National Register districts in Texas as endangered places, recognizing that many lack effective legal protection. More importantly, the City of Dallas convened its Downtown Dallas Historic Preservation Task Force. The Task Force worked diligently to produce balanced recommendations to better protect historic buildings in a way that does not impede appropriate new development. The implementation of these recommendations is making a critical difference today.